“I hope in the Lord, I trust in his word; in Him there is mercy and fullness of redemption.” This verse from Psalm 130 has a special significance for one who has experienced the call of the Master from the lake shore. My vocation began long before I perceived it, and probably long before I existed. God’s providential action upon my life is a great design that I first recognized about twenty years ago, a design of God’s love that’s worth telling. My father is a reserved, hard-working man of deep religious conviction from rural Illinois, of German descent (which accounts for my last name). His closeness, inspiration, and unwavering example positively influenced my childhood years, giving me that initial formation for which I will always be grateful. My mother is an Italian immigrant of Croatian heritage. Profoundly pious and very energetic in living out her vocation to motherhood, she was responsible for the tangibly religious atmosphere in our home. This first catechesis fostered in me an openness to imitate the saints, appreciate the Mass, and pray the Rosary. It was the fertile ground in which my vocation was born. I have three older sisters, each of whom played an important role in my early formation, sometimes actively, and other times simply by giving the healthy counterbalance to the spoiling attention that the youngest in the family may receive. I perceived the first hints of the priestly vocation around the age of ten. It was a simple affinity to the things priests do: he brings people to God, and that had to be something great. My family environment, where we all understood that the goal is to become a saint, certainly helped a lot to foster this affinity, but there were also other elements: the dedicated testimony of diocesan priests I knew, as well as the lives of the missionary saints with which I became familiar—thanks to the attractive publications of this sort that Pauline Books and Media provided—and finally the visits of some of the priests and religious of the Legionaries of Christ to my home in St. Louis, Missouri. I had always wanted to graduate from the Air Force Academy, as had my brother in law, and become a pilot. Naturally, my affinity to the priesthood had to compete with these plans. I started looking for ways to reconcile the two: surely they could use a flying chaplain? When I realized my eyesight fell short of the 20/20 vision that piloting required, the airplanes lost a little of their grip on me. Thanks to the encouragement given me by Fr Kermit Syren, LC, in August of 1991, I went to the summer program of the Legion’s high-school seminary, or apostolic school, in Center Harbor, New Hampshire. It was love at first sight: the environment was joyful and it gave me the spiritual and human challenge I was looking for. It took a few years, for me to realize that every experience of that summer played a particular role in drawing me to follow God: not least the White Mountains, where the apostolic school was located, a welcome contrast to my flat hometown state (“If hiking the White Mountains was thrilling,” I thought, “what would skiing them be like?”). It was the “topping off” of an early decision: I was twelve years old at the time. But God’s plan for me was to take a little longer. I told my family of my decision to join the minor seminary, and they did not approve. It was five against one: two parents and three sisters, so I had to yield. Things took a turn a year later when in 8th grade I attended the school started by the Legion in my home town, Gateway Academy, in its foundation year. The experience meant a lot for me, highlighted by the 8th grade boys’ Easter pilgrimage to our major seminary in Cheshire, Connecticut, and the one at Center Harbor that I already knew. My interest in the apostolic school was reawakened when, upon arrival to Center Harbor, I saw all of my friends from two summers past—now wearing the characteristic red sweater uniform of the apostolic school. Things simply could not remain this way: they were already on the road towards the priesthood, I was not, and the summer was barely four months away. The summer of 1993 rolled around, I did the summer program again that August, and the month-long program shot by as if it were a week. At the end of it, my dad told me that my soccer team back at home, the team I had drilled with and played for the past 8 years of my life, finally won the regional tournament (while I was gone). This news put me into a rueful mood, and it took me a little while to recognize the rather blunt hint from God that I had to leave it all behind: the apostolic school would have to take first place or no place. The moment I really awaited was the beginning of the school year: I envisioned myself wearing the coveted red sweater of the seminarians. That landmark moment of my life came September 3rd, and my emotions ran high. Even though this initial sentiment wore off with time, my desire to achieve the ideal and mission of the Legionaries of Christ was rooted in me. Since then, it has been a story of God’s constant grace and gentle hand guiding my life, mediated by the Blessed Virgin Mary. Whether that meant passing Latin, with which I struggled in my freshman year, being accepted to the religious profession of vows at the end of novitiate, or being ordained to the priesthood of Christ, I have learned that the Lord chooses whom He wills. The calling is essentially God’s business, as long as there’s cooperation with his divine design. I am eternally indebted to this presence of God in my life and that he chose me to be a soul consecrated to him. My deep gratitude extends in a special way to my superiors, who are instruments of God. I look back upon the days and nights of their sacrifice and concern for my formation, and today I bear witness to their efforts for the priest I have become. 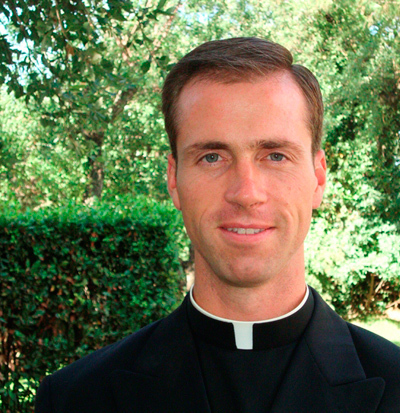 Fr Gregory Usselmann, L.C., was born on January 16, 1979, in St. Louis, Missouri. He completed elementary school in 1993 as member of the first graduating class of Gateway Academy, the Legionary elementary school in Chesterfield, Missouri. He began freshman year that fall at Immaculate Conception Apostolic School, in Center Harbor, New Hampshire, and completed high school in 1996, entering the novitiate of the Legionaries of Christ on September 15 of the same year. He completed his studies in the classical humanities in Cheshire, Connecticut in 1999. During his internship, he was the dean of students at Oaklawn Academy in Wisconsin, and later on for the Legionaries’ high-school seminaries in Ontario and California. He obtained a licentiate in philosophy in 2007 and a bachelor’s degree in theology in 2010 at the Pontifical Regina Apostolorum College in Rome. Where do priests and religious find fulfillment in life?